These are seriously so good that I swear they’ll beat any kebab and falafel combo that a 1.00am service, or any other time, can offer you. 1 To make the patties, put onion and red pepper in a medium frying pan (skillet) with 2 tablespoons oil over a medium heat. Cook for about 12 minutes, until tender and onion is lightly golden. Add garlic and cook through for 1 minute, then add coriander seeds and cumin and cook for a couple minutes more. Take pan off the heat and let the mix cool for a bit so by the time all the ingredients come together, the egg won’t curdle or cook or whatever it does when around piping-hot ingredients! 2 Drain chickpeas, rinse them thoroughly and drain again. Mop dry with paper towels. Put them in a large bowl and partially mash and smash them with a potato masher; don’t go too OTT here as you don’t want to make it into a hummus! Keep it lumpy and textured. Add onion and red pepper, egg, panko crumbs, chopped coriander, lemon zest and salt and mix well. 4 In the meantime, for the chilli yoghurt dressing, mix yoghurt, salt and chillies. Sprinkle mint and ground cumin on top and swirl through. Easy! 5 To make the vinaigrette, cut the tomato in half, remove the core, then dice flesh finely. Drain in a sieve for 10 minutes. Mix remaining ingredients in a bowl, add drained tomato and set aside until ready to serve. 6 Heat 4 tablespoons olive oil in a large frying pan over a medium heat. Fry patties until nice and golden, turning them carefully with two spoons. Transfer to a plate as they are done. Assemble bunnuces (Bunnuceae? Bunnuceum? Bunnucezums?? Haha) by putting chickpea patties in lettuce leaves with spoonfuls of tomato dressing and generous dollops of yoghurt sauce. Fold up, try not to dribble juice everywhere, and eat! YUM! Don’t expect these patties to perform like meat ones – they are very soft and delicate in texture, but their deliciousness makes up for any shortcomings in that area. You can make them more than an hour in advance – they’ll even hang in for a day ahead, just keep them covered and refrigerated. And, once they’re cooked, they’re great to take to work for lunch. Yum yum. The yoghurt dressing is also good for a day or two. Keep it covered and refrigerated. I also love it on barbecued chicken or lamb, or on fried eggplant. The tomato vinaigrette will also keep well for a day, providing the tomatoes are nicely drained before mixing with everything – otherwise, they give out water and dilute the dressing. Can you tell me if once I have Ilaria’s chickpea recipe all ready to fry if it is possible to freeze half the mixture and just cook the remainder? I’m cooking for two so it would be good to be able to save half for another day rather than trying to divide her recipe into half quantities. 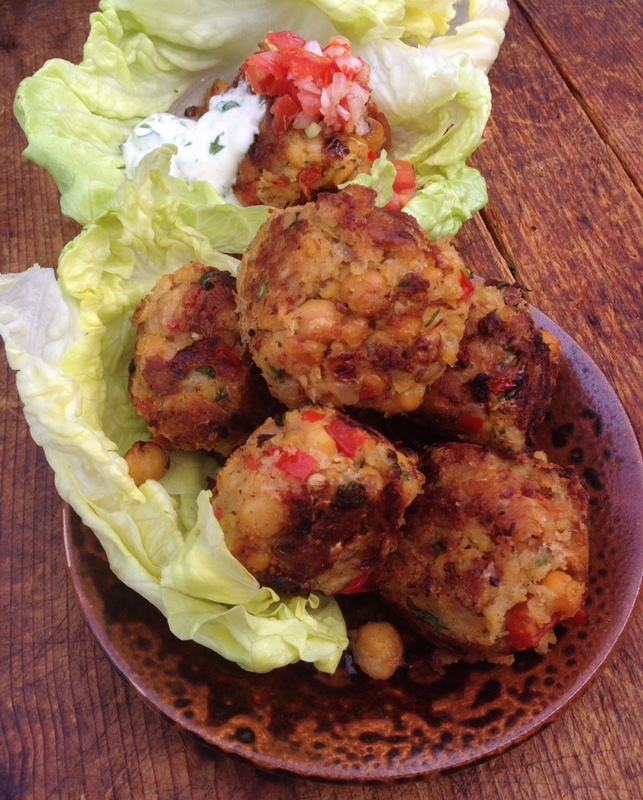 Great recipe by the way – I love using it like a sort of Moroccan Larb with the lettuce. Yep, hey Martin, I think it will freeze really well. Handy meal to have prepared. Like your concept! Spicy and warming, Ilaria's got just the thing for cold nights!